Check out one of the cutest embroidery designs from our original Christmas collection! This particular one features a robin waiting for the Christmas celebrations to begin. The robin’s plumage is a mix of saffron, auburn and peach blossom. It’s wearing a red Santa hat and a scarf. 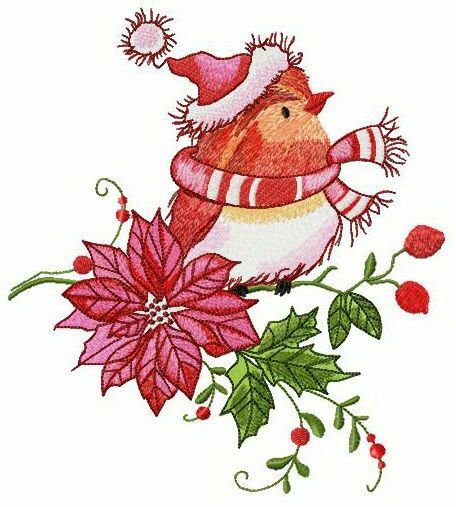 The little bird is surrounded by bunches of holly and lush flowers. This creative needlework is rich in color and detail coming as a tremendous decoration for a variety of things: sweaters, mittens, scarves, shopping bags, purses, towels, bathrobes, pajamas, blankets, quilts, bed linen, etc. The application stitches out beautifully to all sorts of suitable fabrics.